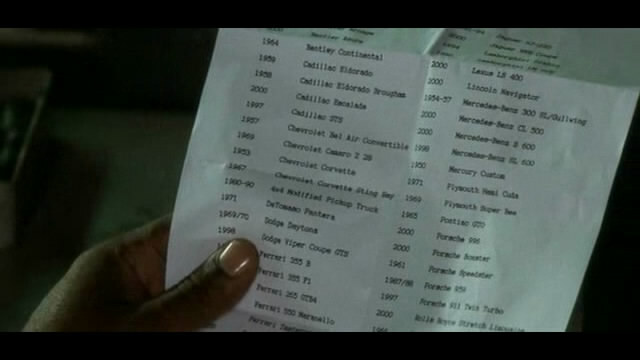 they didn't show every single car on the list i posted in the movie!!! I added all the cars some time ago (I think I did not forget any), but as you said some were probably never seen in the movie. I love this movie, but is it necessary to list the vehicles, when they did not actually appear on the screen? In lot of movies characters are talking about cars, they own, but they are never listed.. I am just wondering.. Your pictures look not very sharp, I guess they do not come from the DVD ? The few captures that I made were coming from an old divx. That list does not really match the one from IMDB. for example - 1980-90 4x4 modified pick-up truck - not a single word about Ford F350.. It is not the only list, there are two others: one written with invisible ink, that the cops discover when they find parts of a black light bulb. And a second one that Memphis and his friends write on the chalkboard. the other cars are not visible. Except for F355 F1 and Jeep Comanche - they were there, but i am too tired to try to find them again . Eeeeh, just one question, what the hell are a Volvo Turbo Wagon R????? Do you mean a Volvo 850 R??? Moller wrote Eeeeh, just one question, what the hell are a Volvo Turbo Wagon R????? I like'd the original movie better. Yesterday, I saw an orange 1969 Camaro with the license plate "GONE N 69"
modell wrote "GONE N 69"
This is one of my favourite movie. But there isn't any Audi in the list!! Interesting. In the first picture wickey provided, there's a car called a "1969 Plymouth Super Bee". incog wrote Interesting. In the first picture wickey provided, there's a car called a "1969 Plymouth Super Bee". leoz wrote Man, I love this movie for the classics and chases. End of. Thought the original had little pacing, just cut to the chase, and without Nick Cage! ... Poor guy, been in so many rubbish films! No mention or pic of the '53 Fiat Vignale? I was the mechanic on the remake. The last cars shown "the joke car". was a gt 390 with a 4 speed. I took the 390 out and put in a ford motorsports 351cid. The rear end was out of a Lincon. It was a 9 in with 4:11 posi. This car was the badest car in the movie. During the prep stage of the movie, this car was choosen to be "Dumbed down" as the joke car. After the movie was finished, this car was fully restored and was sold at auction for over $125,000.00. Before selling the car, I removed the 4 speed and replaced it with a c6 from the only real gt 500 purchased for the movie. I installed the 4 speed into the GT500. it was a gt 390. 4 speed. The 390 was replaced with a hp351. This car was built as a shelby gt500 (not an Elanor) but at the last minute dumbed down as the joke car. The front loader that the jeep crashed into at the docks was built from a ford monster truck. Look at the tires. 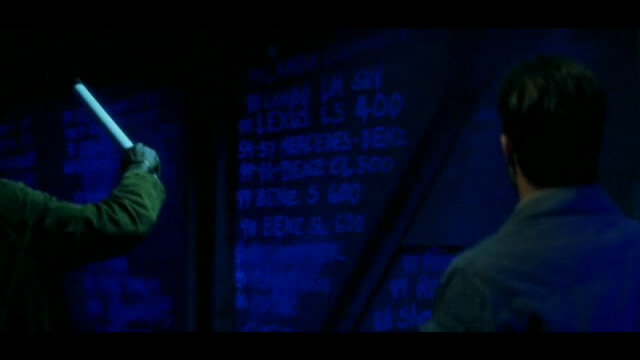 svdrj wrote I was the mechanic on the remake. The last cars shown "the joke car". was a gt 390 with a 4 speed. I took the 390 out and put in a ford motorsports 351cid. The rear end was out of a Lincon. It was a 9 in with 4:11 posi. This car was the badest car in the movie. During the prep stage of the movie, this car was choosen to be "Dumbed down" as the joke car. After the movie was finished, this car was fully restored and was sold at auction for over $125,000.00. Before selling the car, I removed the 4 speed and replaced it with a c6 from the only real gt 500 purchased for the movie. I installed the 4 speed into the GT500. No way! Dude your effing awesome!! Tell me, did the eleanor really have NOS? Kid, can you leave your imanginary world and realize, that "Eleanor" is just a movie prop? Nightrider wrote Kid, can you leave your imanginary world and realize, that "Eleanor" is just a movie prop? Now it going to be quite interesting, mature, and very educated discussion. None of you are being very mature. Nightrider, if people are interested in these vehicles then let them. This site is for fans and aficionados such as him who are interested in movie vehicles, even if you aren't. But you can't say that this should be a "mature" discussion when you yourself are the one trolling in the first place. majorhawke, just watch your language next time. We ask that all of our members act in a civil matter. Nightrider wrote Now it going to be quite interesting, mature, and very educated discussion. But you went to the link, right? Certain cars of that period impress me much than SuperSnake. Also: how it related to this movie? The best thing about this movie was ithat it drew attention to the original 1974 version. Acting was far better in this remake and the plot moved along faster and was easier to follow but I like car movies and this wasn't one, it was a movie that had some cars in it and was clearly made by people who weren't into cars. Plus CGI for stunts always annoys me and it was fairly awful in this. Better CGI than destroying real classics. You tend to find they destroy the classic cars anyway, at least one or two will be cut in half for interior filming or to be towed behind a camera car. They'll get automatic gearboxes put in, original parts ripped out for reliability and often the cars are crushed after filming to avoid potential lawsuits in they are sold to the public. Modern audiences expect huge explosions and big stunts and that's because CGI has conditioned them to it. I miss the old days of proper car chases. For me CGI has destroyed a lot of the realism and credibility of filmmaking. Why bother even leaving the studio or making sets? Do the whole damn thing on green screen. There is a Volvo Turbo Wagon R. It is a 750. Sorry, tried to add the VW Eurovan (seen just after Drycoff says "that sign said DO NOT ENTER"). I had too much trouble with uploading the picture. The only computer generated stunt here is the final jump (exceptfor the landing), and they probably made the scenes with the actors driving with a green screen. But the rest of the chase is done by stuntmen. I just came across a Youtube video which contains part of the final chase (sadly, I've been unable to find the rest) from the director's cut. This version is longer, and I added some vehicles from it. I put their roles with stars, and not as "deleted scenes cars", just like we did with /movie_1606378-A-Good-Day-to-Die-Hard.html. Does anyone by chance have the full extended movie so we can complete the page? aolju wrote Does anyone by chance have the full extended movie so we can complete the page? It would be nice in HD, too. 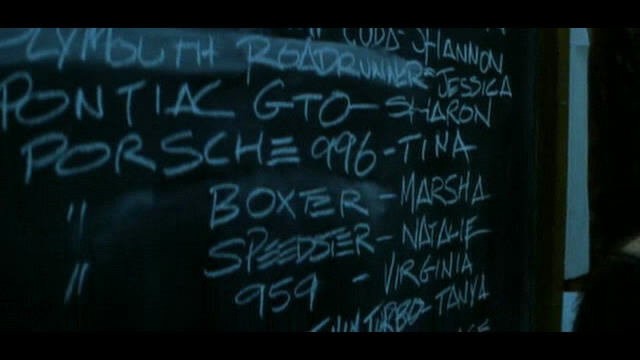 Also, we should add the names of the car (the code/girl-names they give them in the movie) to extra info. Gone in Sixty Seconds - you are here. During the big chase, Eleanor and the cops pass a blue 1971 Dodge Charger...twice. Anybody have stills of that? I couldn't find the Acura Integra & Ford Bronco II on my Blu Ray, and I forgot a Freightliner truck. I left some very background ones like /vehicle_1001965.html just because appear to be rare models. Another car missing on this list is a California Highway Patrol Ford Crown Victoria parked outside the diner that was being pointed to Johnny B by Memphis. The German title is "Nur noch 60 Sekunden".